…we heard donkey-like braying that came from Zebras. Are they white horses with black stripes or the other way around? It was curious to see birds on their backs, getting a free ride from the zebras. It is a symbiotic relationship, our guide explained. 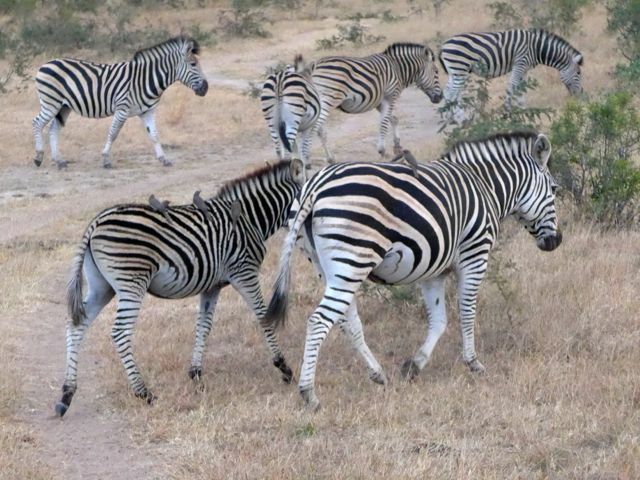 The birds feed on the ticks on the zebras and the zebras rid themselves of the parasitic ticks. This was a relationship that we would see on many animals… rhinos, giraffe, etc. Birds on their backs or not, we saw the zebras doing the wild thing in the wild! … just then, the smaller rock moved and ears, eyes and nostrils came up to take a breath. 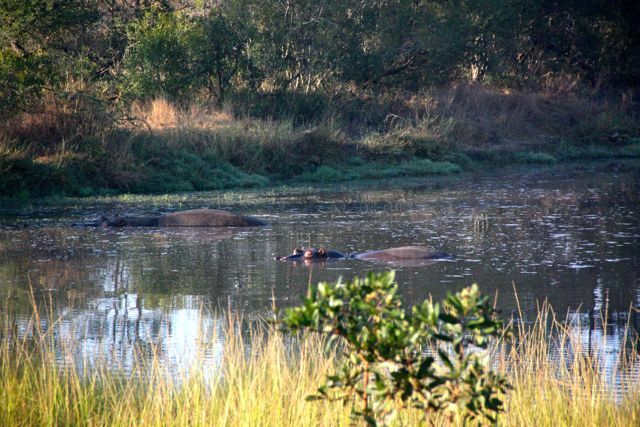 The rocks were two male hippos napping in the water hole. Sipho, our guide, explained that they had probably been kicked out of their herd and were now on their own. 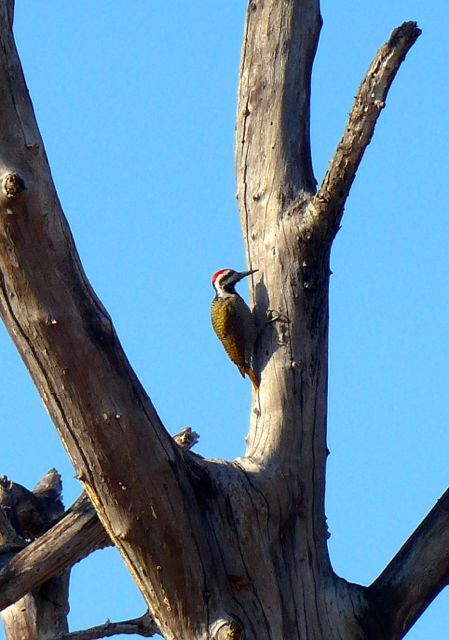 …and a male bearded woodpecker busy searching for insects. … who seemed to be cautiously watching us. We were told that they are incredibly stupid, following each other like lemmings. 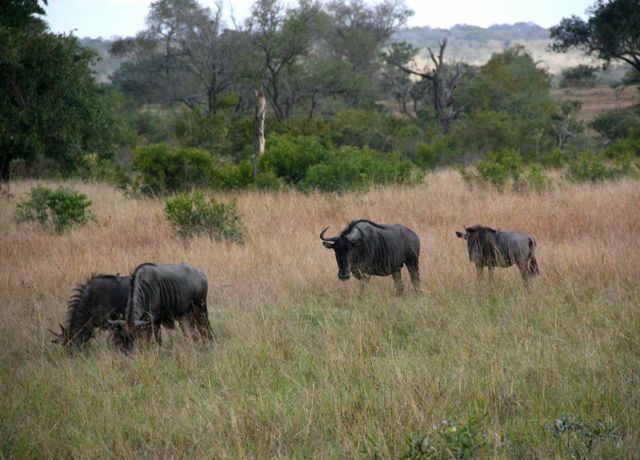 On another afternoon drive, as we drove by a grassy field, a warthog ran across and stopped to look at us. Looking very Pumbaa like, he raised his face to us and we clearly saw the characteristic warts on his face. 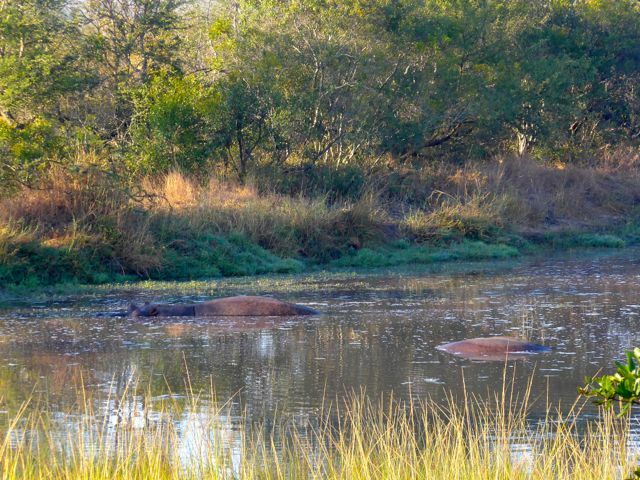 Our guides told us that they sometimes eat warthogs, roasting them with herbs and spices. 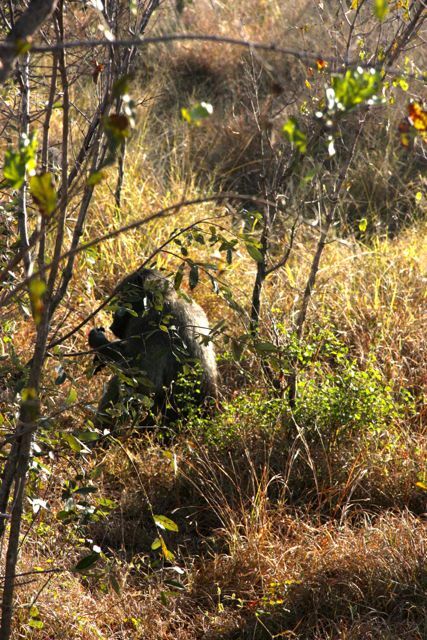 On our last drive, we came across a troop of baboons. 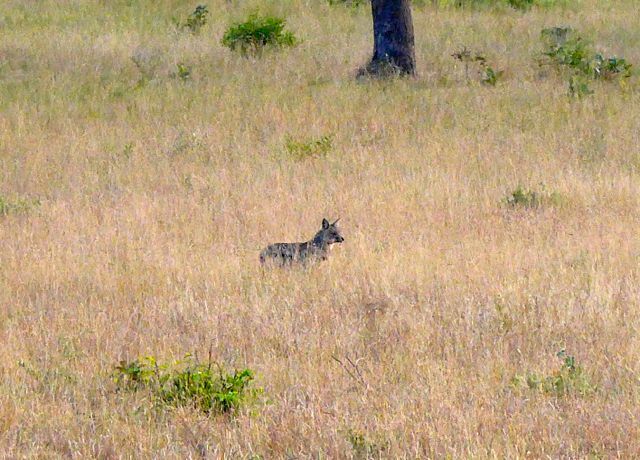 They were in a frenzy and our guide said they were in the process of figuring out the new alpha male. 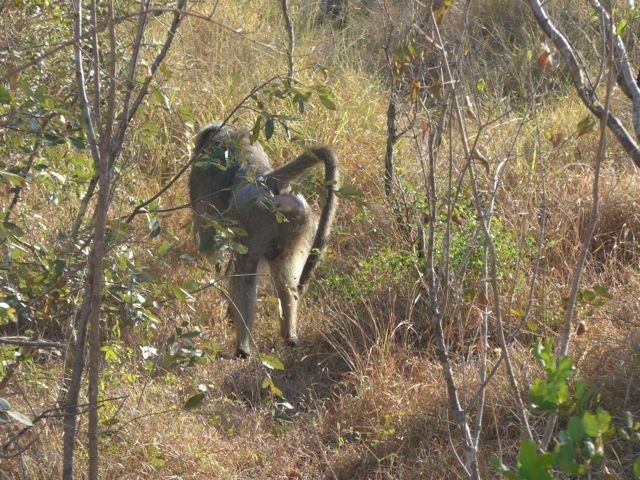 I guess this baboon lost because we saw him high tailing it out of the group! We also saw but didn’t get photos of several mongoose crossing the roads, a Mozambique spitting cobra (venomous) right at our feet on the path from our villa to the main lodge, and a few others I can’t recall the names of. It was an exhilarating four days in the bush, an experience that we know will be with us for many years to come! 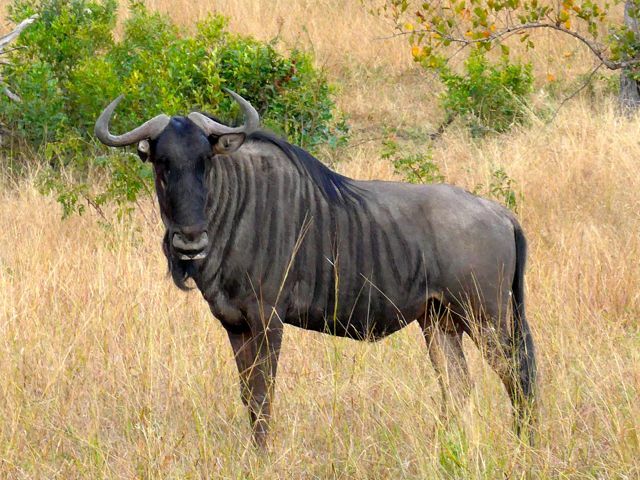 If the buffaloes escaped you this time, you probably don’t need another bloodcurdling moment as with the lion and leopard encounters, although the animals after having had a fill of their prey, were less likely to bother you. But how complacent can one really be? Our hair-raising experience happened on an evening drive when we came upon a herd of buffaloes crossing the road midway, probably more than thirty heads of them. We stopped to take photos and just after we thought they had crossed and were finally moving on, a large one, probably the head of the herd turned around , just several feet away, lowered its head and with an angry stare and then a twist of its neck appeared to make it known that we better go on our way. 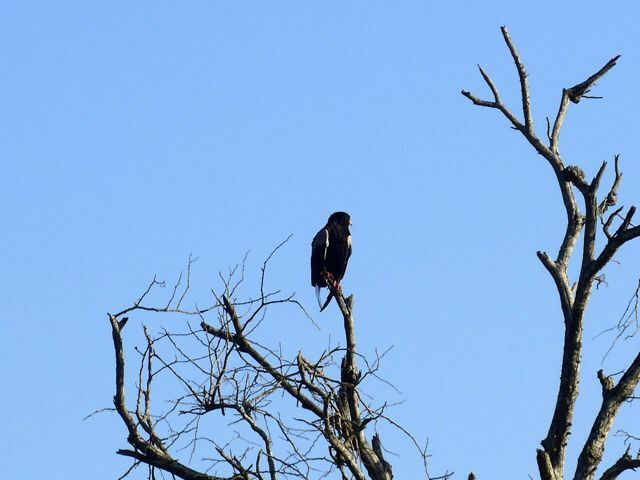 Our ranger promptly headed us back to the lodge as we all heaved a sigh of relief and regrouped. Gary Gnu!!!! From the Great Space Coaster!!! Oh my…does anybody still remember him??? Ha ha ha. If you do, then we are probably of the same generation :) I can’t believe there was a real animal behind him. So cool. I googled the lilac-breasted roller for a closer shot photo…and it looks absolutely amazing!! Start of a great summer for many of us in the MM ‘family’ – we have been going on safari!!!! Thank you for sharing. Yes, I too got on board the Great Space Coaster. And New Zoo Revue. 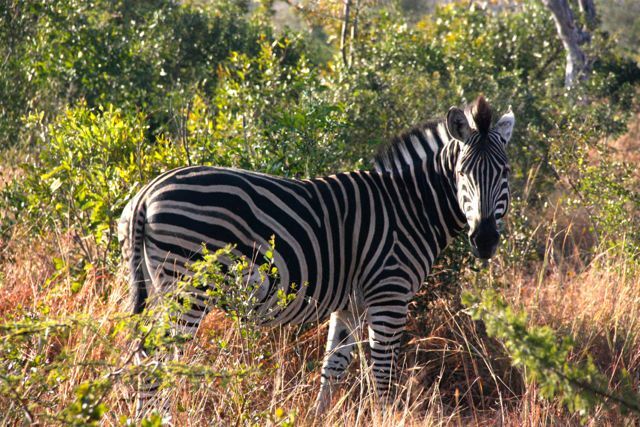 hmmm… i realized only now that zebras have gray stripes between the black and white ones! Mrs. MM, you’re so funny too! There’s no gnu, like a good gnu, like Gary Gnu!